Thread form is easier to read than IRC discussions, and open to everyone. Here, you can post not only bugs but also your opinions on how Yocto should be developed in the future. So gameplay-wise discussions are welcome as well. Post your observations, suggestions, bugs. Another day miles underneath the ocean surface, in a base overwhelmed by surrounding silence and calm. No signs of intersystem human-alien conflict. Into the project coordinator's office runs a young scientist with a scrap of paper in a hand, breathing heavily. - What's inside the containers we've received recently? Organic matter?! - It's subject to analysis. Don't bother. Last edited by Pevel on Thu Jan 02, 2014 5:09 pm UTC, edited 1 time in total. Bent vents/gratings on walls don't suit me. The texture from the inside of the arc will do to replace it. Any feedback from someone who downloaded the map? It looks nice, but I'd add a ladder to the circular pit so s1 humans can get out w/o using /kill. S1 humans can get out Tony Hawk style using ramps. While for me as a designer it's quite obvious, some players may find it tricky. So maybe I'll add a ladder there. Pevel wrote: Any feedback from someone who downloaded the map? I would be interested in helping out with this map. I think the lighting needs a fair amount of work, and I would like to help here. 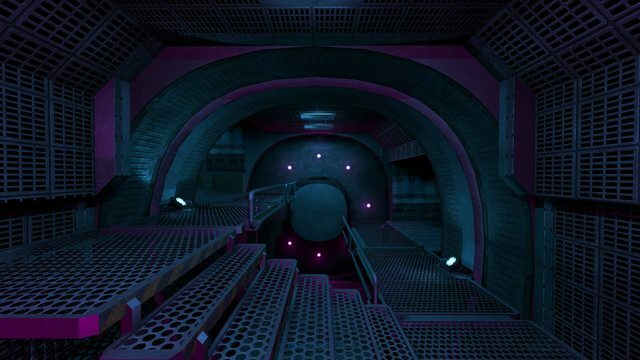 I have worked with mainly Doom3-like engines before and have some 3D modelling experience. I think the blue consoles could see some attention to make them a 3d console using that same texture sheet so I could make a model for that, any format preference? I don't think it has been fixed yet, but last alpha there was (still?) the engine bug where the water "splash/ripple" texture doesn't get coloured by the light in the (vents/mini short cut?) area. I get terrible fps in the alien base but that's another p.s. efficency problem. Apart from those, I guess your map is good as is. Probably increase the height of the hallways around the alien side entrance hallway though, it kinda annoys me when I hit the ceiling and bounce back and lose airspeed. I don't know, it just feels somewhat cramped.